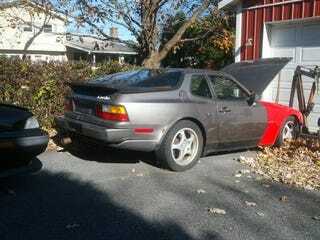 Up for sale is an 87 Porsche 944 Turbo. Seller states that the car was in a "minor fender bender" which resulted in damage to the front right end of the vehicle. Seller also stated that the car has been sitting for a few years, this could be problematic. 944 Turbo's in decent shape usually sell for upwards of $4000, so this could be a NP. But I would be weary of that "minor fender bender" and also that the car has been sitting for so long. The seller posted a video which shows the car's inspection/reg tag, and it looks like it's showing 2006. So Oppo, NP or CP? The listing, and more pictures, can be found here.